I've heard much interesting 'nonsense' spoken about this topic so I just want to clear a few things up as this was always a question I was asked on a near enough daily basis on the River Tay while serving as a professional salmon guide. On a floating line where you're fishing a high fly in the water column a leader of between 10ft & 12ft is generally more than adequate. Personally I've never ever fished a 15ft plus leader for salmon in my life and have done well enough at catching fish on a full floating line when the occasion to use a full floater arose. I cannot see the sense or benefit in huge long leaders where a salmon is only logically 'ever' going to see your salmon fly first! Nor do I ever want even the slickest leader knot in my rod rings at salmon landing time! With an intermediate sink tip or full intermediate fly line I'd reduce the leader length down to approx 6ft as you do not want a longer leader which will allow most salmon flies to ride up higher which negates the sinking effect you're trying to achieve for your salmon fly in the first place. I've always been a fan of lightish flies as I've always admired their superior stream movement better than heavier less 'life like' equivalents so let the sinking tip or sinking fly line place your fly where you want it and not the weight of the fly. For the heavier 'artillery' range of sinking tips or sinking fly lines that are availably these days via the clever use of tungsten I'd shorten my leader right down to as little as 3ft with a very heavy 'type 7' (or heavier) tip or to a 4ft to 5ft leader with a regular 'type 3' tip as again you don't want your sink tip down and the salmon fly riding higher which it will do with a longer leader. Keeping a few coils of different weight leader material in your fly box is sensible so you know you've got spare leader material with you at all times as forgetting a spool of leader material is easily done. I get the long light leader theme if you're pursuing stocked trout that have been caught, released & educated on numerous occasions and that could be coming for your fly from any angle which means they are more than likely going to see your leader first and get a real chance to inspect the presentation of a trout fly or lure. If you think about working your salmon fly methodically 'down' through the pools of a river the only salmon that's going to object to your leader or fly line is a fish that has already objected to your salmon fly by completely ignoring it! 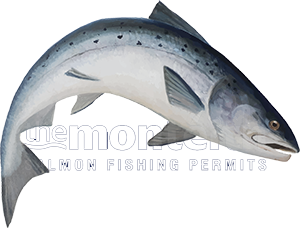 It is logically much more difficult for a salmon to either see the leader or fly line when the fly is in front or is pulling away from the fish and any interested salmon will be far more preoccupied watching the rear end of the fly at that point. Once you've got the misconception of leader length out of your head based on the logic that it's too late to hook any salmon that's ignored your fly and is now seeing your leader or fly line the next very important fact to understand is the thickness, bulk or breaking strain of your leader and the purpose this important component serves. The bulk of your leader should be chosen only based on the energy transfer you are looking to achieve to match the weight of the salmon fly you are fishing with. In other words on your forward cast delivery power stroke you want that energy effectively going all the way to the salmon fly and not cut short by some stupidly light leader material that has no bulk even though it may be badged as exceptionally strong. Energy transfer via leader bulk is all you should be thinking about and critically so if you're fishing a bigger salmon fly. Since I was a salmon parr I've always used Maxima Chameleon as my leader material and I know many other professionals who use this very same monofilament. Maxima can handle knots, abrasion and even starts to fade to a pinkish colour when it's degraded so 'visually' you always know if the material you're using is 'goosed' or not. Maxima Chameleon is also inexpensive and a bulk spool purchase will last most anglers a 100 years! With regular size 9 salmon flies on the Tay I'd be fishing with an 18 lbs test leader which may appear to some as overkill. On the deep heavy flow pools of the Tay and the real possibility of a heavyweight salmon at any time of the year going a bit heavier is always advisable. Rarely will I drop down in leader strength unless fishing the tiniest of low water Summer salmon flies. With heavier tube flies a short 3ft or 4ft length of 25 lbs Maxima Chameleon leader material is just about perfect for a 'bullet' type turnover at range when big bulkier tube flies are required!